INFRARED IC HEATER T962C works automatically by micro-computer control. Can satisfy a dissimilarity SMD、BAG Soldering a request. Whole soldering process to complete automatically, easy to use, Adoption fast infrared radiation and circulation the wind for heat, so the temperature is very Accurate and even. The faintness controls a technique and Can see the drawer type work bench , Make whole soldering process at you of the under surveillance automatic completed; Can soldering the most smart small part. Adopted a high and dependable design, make what you use gratifying and rest assured. Soldering area to reach effectively :400x600mm, Increase the usage scope of this machine consumedly, economical investment. ★. (2) Many temperature wave choice for you. Memory eight kinds of temperature parameter waves can be provided as choice, and establish to move heating and cool off function compulsory;Whole soldering process to complete automatically, easy to use. ★. (3) Special heat up and temperature equalization with all design. 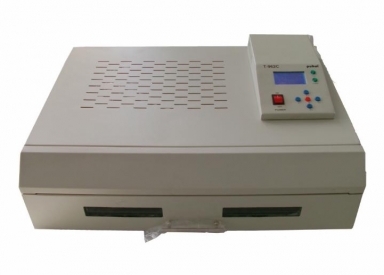 Output the power reaches to a 2500 W, Adoption fast infrared radiation and circulation the wind for heat,so the temperature is very Accurate and even, Whole soldering process to complete automatically for you choice temperature parameter waves. ★. (4). Humanized science and technology exquisite article. The agile physical volume and weight, let you economize a great deal of money, the set noodles type places mode, can let you own larger space; Simple operating instructions, let you a see can use. ★. (5) Perfect function choice. Return soldering, drying, heat preservation, finalize the design, fast cool off etc.can use Can soldering the most smart small part example CHIP、SOP、PLCC、QFP、BGA etc; Can used to the gum of the product solid turn, the circuit board is hot aging, the PCB plank maintains to wait various works.Be applicable to each kind of business enterprise,company extensively develop and the small batch quantity produce a demand.